Reflections on Faith and Culture: Maybe I missed my calling . . .
Maybe I missed my calling . . . I have had a very poor training in music, but as a young boy I imagined how wonderful it would be to be a symphony conductor, to be able to perform the subtle little gestures that would help bring harmony to an orchestra of gifted musicians. Given my musical limitations, I later turned my unrealistic fantasy to tap dancing, and I even gave it a try, until my daughter (whom I coaxed into taking lessons with me) gave up on it. Seeing this video -- which I love -- makes me realize how much I would have enjoyed being a traffic cop in Pittsburgh. God bless people like Vic Cianca. If only we could each bring this kind of joy into our work and our daily lives. Nobody directed traffic like Vic Cianca. 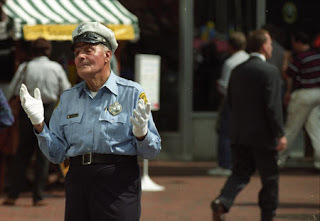 During 38 years as a traffic cop, Cianca's combination of dance moves, genuflections and exaggerated facial expressions made him a Pittsburgh — indeed, national — icon when "Candid Camera" creator Allen Funt got permission to secretly film him while directing traffic Downtown, then aired the graceful and often hilarious scenes in a 1964 episode. Victor S. Cianca Sr. of Brookline died Sunday morning, weeks after suffering a heart attack, his family said. He was 92. . . .
His son, the Rev. Vic Cianca, vicar general of Assyrian Church of the East, said his dad's unique style of using his whole body to direct traffic came naturally. "We're Italian, and we're very Catholic," he said. "Dad would always make the sign of the cross whenever there was a problem. He'd do the same thing while directing traffic." What an inspiration. May he rest in peace. Regarding conducting, Gil, it's not a matter of talent in your case. While I have witnessed from you a certain amount of "intellectual certitude" that may be, depending on the listener, entirely appropriate and refreshingly honest, or perhaps a bit excessive at times :), I still must maintain that for a conductor your ego is simply too small, you're not certain enough of your own righteousness, and you are too aware of your place in God's world as opposed to thinking you just might be God.